These three seemingly unrelated stories collide at the Solomon Springs natural wonder held sacred for centuries because of its legendary healing properties. Murder shatters the spiritual calm that is Solomon Spring. 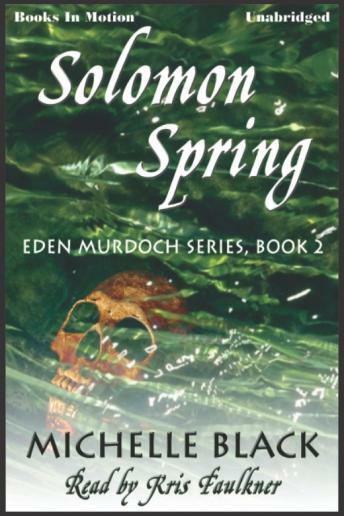 Seeking solace from the turbulent life she has led, Eden Murdoch returns to the Solomon Spring. The tranquility of this timeless place will soon be corrupted by a local businessman who plans to exploit the sacred waters of the Spring. Eden's earnest fight to prevent this sacrilege is interrupted by her own past. Brad Randall, her one-time lover, arrives with the astounding news that the infant son Eden lost fourteen years before has been located and is living nearby. The joy of her reunion with her son and with Brad, is clouded by the reappearance of her long-estranged husband, Lawrence Murdoch, who seeks sole custody of the boy and of the prosperous ranch the boy will inherit from his adoptive father. The warring couple engage in a vicious battle, both legal and emotional, with an unexpectedly deadly outcome.